Thermopolis, Hot Springs County, Wyoming and Big Horn Basin Real Estate. 502 South 9th – $80,000. 501 S 6th – Elk Antler Inn – $600,000. 889 Highway 14 – Greybull – $800,000. 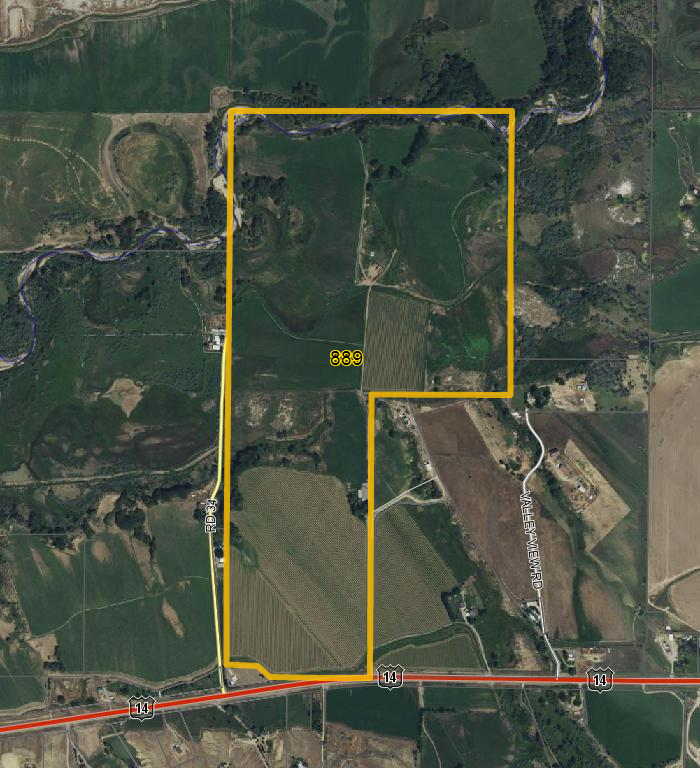 This 239 acre property (182 acres irrigated) would make an excellent addition to any agricultural enterprise, or be a great stand-alone property. The charming house and mountain views only add to the appeal of the land production and recreational value. This would make an exceptional investment property, with top end lease value for grazing livestock. If a buyer wanted to have their own small operation, this would also be a great location for that. Whether someone wanted the land for grazing, hay production, cash crops, or all three, this land could do it all. The land is currently all in flood irrigation, but with one larger 50+ acre field by the house where pivot installation would be well suited for the area. For the outdoorsman, this land provides excellent cover for whitetail deer hunting and pheasant hunting, as well as the creek frontage for fishing and duck hunting. One look at this land, and any prospective buyers could see not only great potential for return on their investment, but also a great place to live and settle down. equipment shed, and tack shed. 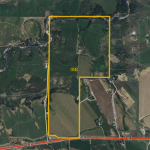 This property has excellent territorial, as well as reservoir water rights for 182 acres of flood irrigation. 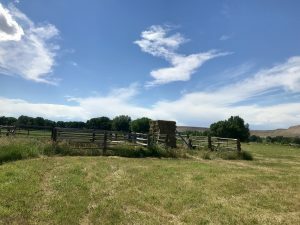 The current owner leases the farmland to a neighboring ranch that has used the land to put up hay, chop corn for silage, as well as run some yearlings on. A quarter mile of Shell Creek frontage provides a year around water source to the property, as well as abundant brown and rainbow trout. Also found on the property are whitetail and mule deer, pheasant, turkeys, ducks, and geese. 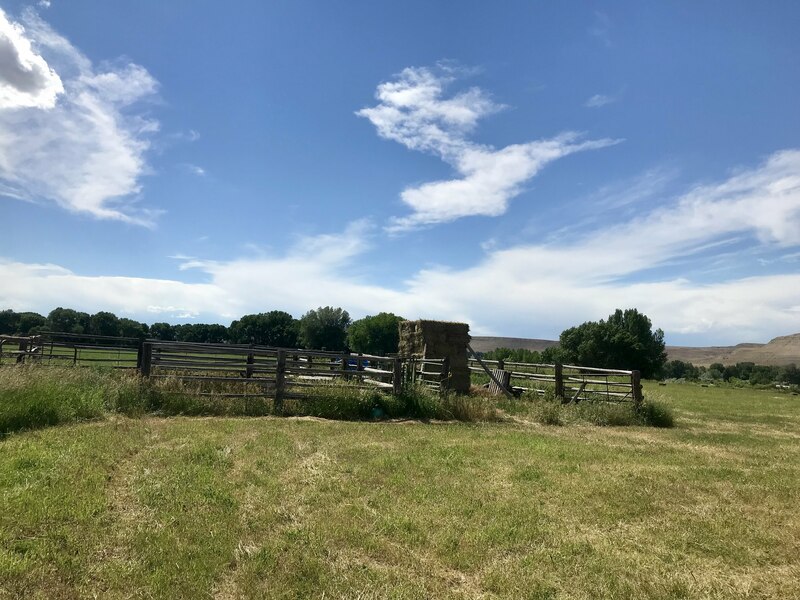 The property is located approximately nine miles east of Greybull, WY (population 1847), and about 70 miles east of Cody, WY on highway 14. Average temperatures for Greybull, Wyoming include an average annual high temperature of 60 degrees Fahrenheit and an average annual low of 29 degrees. The average high temperature during the month of July (warmest month) is 90 degrees and the average low in January (coldest month) is 2 degrees. Average annual precipitation is 6.9 inches with an average annual snowfall of 20 inches. This property currently has 182 acres of irrigated ground. The lessee currently grows both alfalfa and grass hay. In the past the ground has also produced corn and wheat crops. More crop history and production numbers will be available shortly. The property has one two story house located on it. Originally a 1408 square foot basement house, an additional 1852 square feet was added on in 1953 at ground level. The house feature four bedrooms and two bathrooms. Along with the house is a two car garage which has a sunroom attached, as well as a half bath. Off the north side of the garage is an open face equipment shed. The property also has a tack shed along with a small set of corrals that would be perfect for a few horses. On the north end of the property there is a stack yard for hay storage. The owner is willing to sell any gated pipe, aluminum tubes, and side rolls currently used for irrigation with the property. All exterior fencing of the property is barbed wire, but some cross fencing on the north end is electric wire, as well as continuous fence around the yard. In the Big Horn County Land Use Plan, the farm falls under the General Rural usage designation. This allows for use as both residential and agricultural land, with any sale of land under this zoning regulation having to meet a minimum 35 acre requirement. All land use designations go through the Big Horn County Planning Board. Aside from the current use as farm ground for hay, this property is full of opportunities for more diversified operations. The land would make an excellent place to run feeder cattle on grass, or develop replacements. With the wildlife and fisheries resources available, income could also be generated from an outfitting lease. Through the additional development of some corrals, the land could also run a small cow/calf type operation. For a buyer more interested in the land investment opportunity, the ground could continue to be leased out and therefore not carry the burden of irrigation and field maintenance. 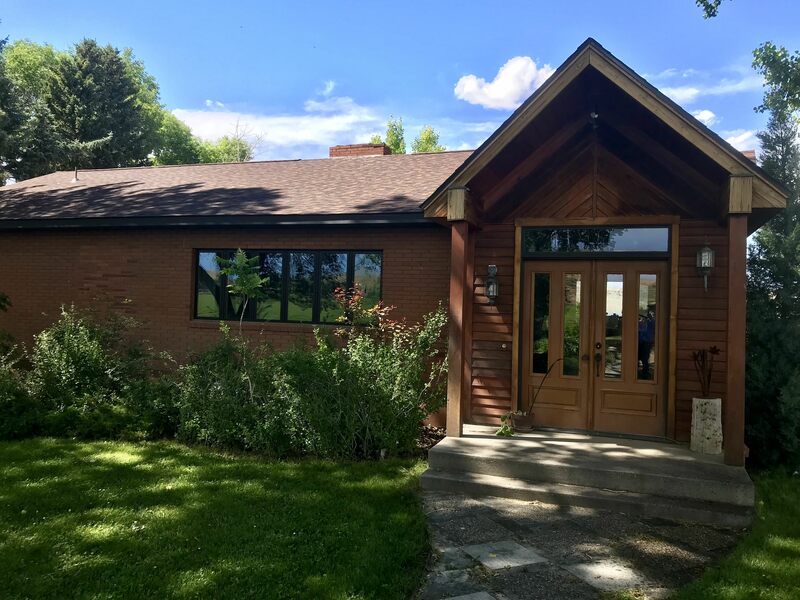 An excellent location, with mountain views and creek frontage, make this a very desirable property that will only continue to appreciate with time. Property Highlights : 239 total acres of beautiful property. Water frontage along Shell Creek. Irrigated acreage. More information of land production and irrigation information is available through our office. UPPER LEVEL: Dining Room, Living Room and Kitchen. 2 Bedrooms, Full Bath and Laundry. BASEMENT: Family Room, Master Bedroom with fireplace, Full Bath, Non-conforming Bedroom, Storage Room. HEATING/AIR CONDITIONING: Propane Hot Water Heat / No Air Conditioning. OUTSIDE: Big landscaped yard, front and back with a wood deck, plus so much more! PERSONAL PROPERTY INCLUDED WITH PURCHASE: Range Top, Wall Oven, Dishwasher, Refrigerator, Washer, Dryer, Free Standing Fireplace, Gated Pipe.